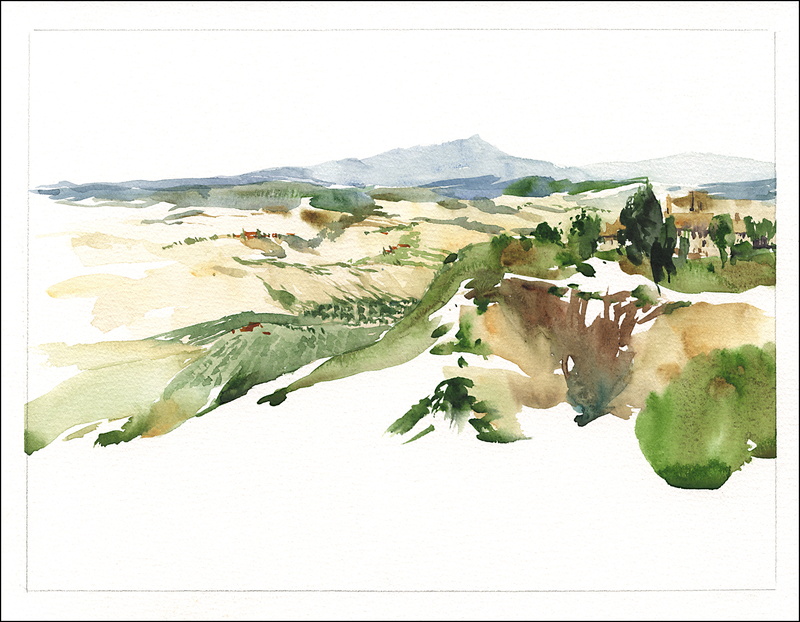 Our week painting with Simonetta Capecchi in Volterra was a different sort of Tuscan experience. Not the usual tour of Italian food and culture the area is known for. She’d chosen the painting locations based around the theme of states of matter. Steam and stone. We spent time in the town of course, the various historic squares and churches – but the real focus of Simo’s locations was the earth itself. We visited many strange landscapes, starting with a drive through an area used for geothermal power generation. The ridge above us featured conical towers with the disturbing look of nuclear power plants. The steep valleys bisected by fat chrome pipelines arching over the road and cutting down hillsides transformed the entire valley into a postmodern sculpture. 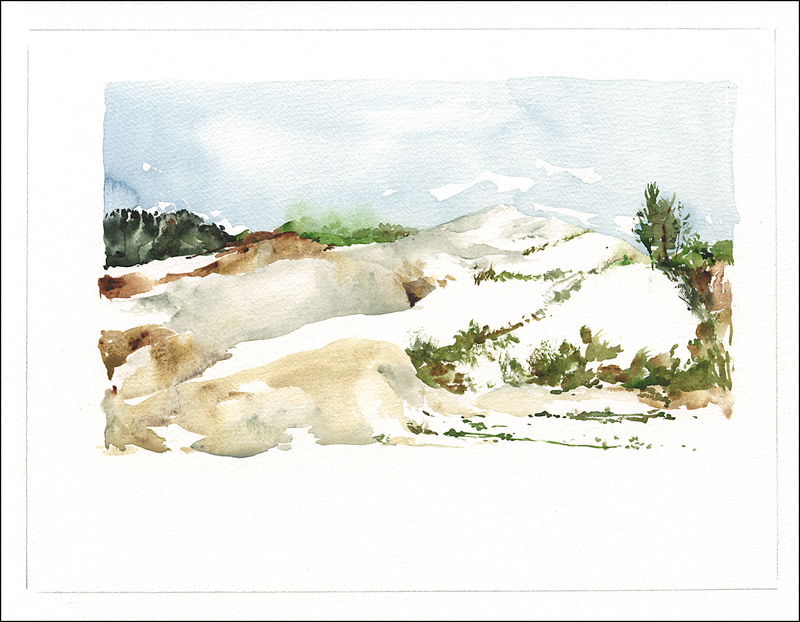 We started the exploration with a short walk through white clay hills that had the feel of a miniature Sahara desert. 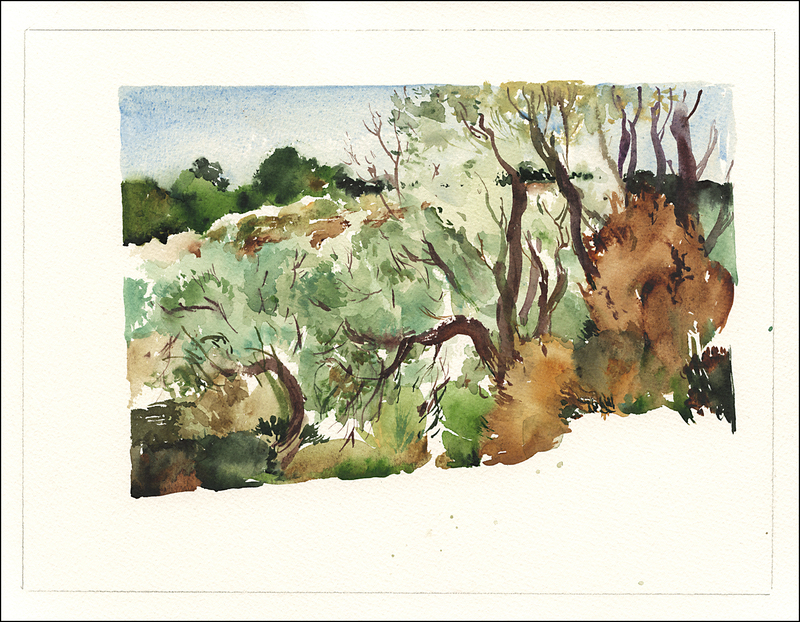 I did a quick sketch of the pale dunes, then turned around and sketched the reverse view directly behind – a stand of hard-scrabble olive trees and tinder-ready underbrush. It was odd to see the two different landscapes sit right next to each other. We had a hot and dry lunch of bread and cheese and moved on. Over a short but steep climb, we started to see the steam vents. Initially just small holes in the earth emitting a puff of smoke that might have been a dust-devil – but soon enough we came to the fumaroles themselves. An area that looked like a land slide or a small open pit mine where there was no top soil – just sand and red rock and big cracks in the earth emitting tendrils of smoke. This is the natural engine beneath the geothermal plants. 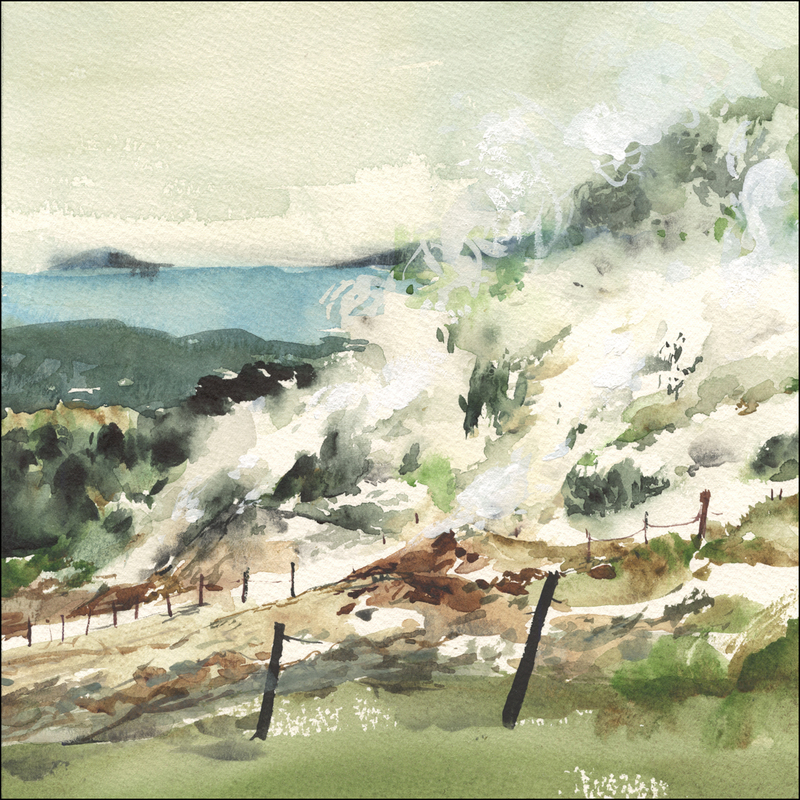 It might have been a moody landscape – there could have been a hellish feeling even – except for the surrounding green hills, and the blue sea in the distance. I was told we could see Corsica on the horizon. The next day we visited The Balsa – a great wall of red rock that is part of the foundations of the town of Volterra. The flat-sided ridge tapers off to narrow pinnacles, reminding me again of miniature versions of other places. Something like what we saw in Utah. I suppose this is the reason for the phenomena of the Spaghetti Western. On the way back from this view point, I pulled off a nice 10 minute sketch while standing in the blazing sun. I strapped my umbrella to my body using my shoulder bag, had to hunch a little to stay underneath it. I’m sure this looked ridiculous, but was the only thing that made the direct sun bearable. I’m continuing to love these direct watercolor sketches. I used to talk endlessly how the drawing was so important, and how everyone should make a careful line drawing before considering color. It seems I’m moving away from that technique – but I suppose I am still making a drawing – it’s just that now I believe you can make that drawing using only the edges of interlocking shapes. The line can happen in the very moment the washes are forming. 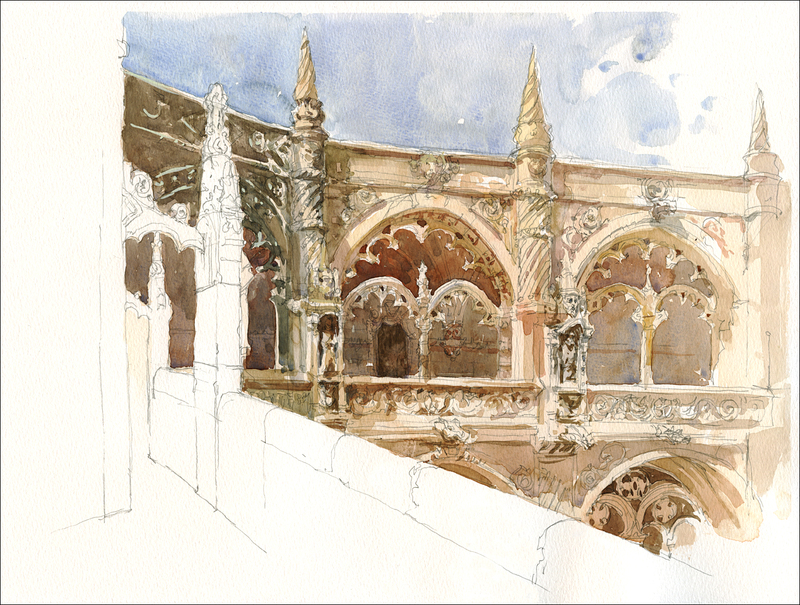 In the time since these Italian sketches, we continued onward to Asia for the Urban Sketchers workshop in Singapore, and a followup painting holiday in Cambodia. So I’ll be showing some more of these ‘shape paintings’ in the next few posts. Stay tuned! These “sketches” are beautiful Marc. (And I only say “sketches” because to me they have the finesse of a finished watercolour!). Incredibly inspiring! Thanks for sharing these lovely, inspired watercolor sketches and the information about the environment. Makes one want to be there. Fantastic Tuscan experience! I like successful direct painting. Just beautiful! As a novice sketcher, I think your process of direct painting without line drawing is more of an evolutionary progression. I know that I’ll first have to master drawing and watercolor technique before coming up with balanced and striking compositions like those you’ve shown us in this post. Thanks much for your generosity in explaining your processes – both thought and action.